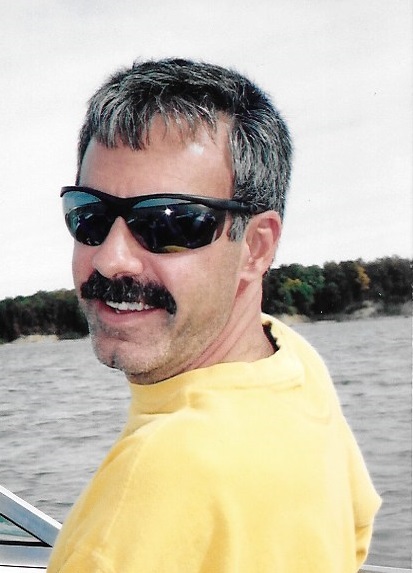 Mr. Joseph “Joe” L. Pellinghelli, 57, of Kincaid, IL passed away Thursday, January 31, 2019 at Memorial Medical Center, Springfield, IL. He was born in Springfield, IL March 13, 1961 the son of Giuseppe “Joe” and Florence (Mose) Pellinghelli, Sr. He married Lucia Lancaster November 10, 1990 in Taylorville, IL. Joe attended Lanphier High School, Springfield, IL while working at St. John’s Coffee Shop. He moved with his family to Tovey, IL in 1980 and worked at the Italian Store J & M Grocery owned by his father and step mother, where he met his wife Lucia. He and Lucia dated for 10 years before they married. Joe worked at the Kincaid IGA in the 80’s and worked at Cardinal Products for several years. He owned and operated the DJ service “Spectrum” for many years with his helper Marvin Kemmerling, Jr. Joe worked for Bunn-O-Matic from 1997 to the present. He had a great love for camping with his family and was an avid mushroom hunter on their land at Lake Shelbyville. He took great pride in his brush clearing job on that land with the help of his children and his best friend Kent Rule. Surviving are his wife Lucia Pellinghelli daughter Paige Ann Pellinghelli and son Joel Don Pellinghelli all of Kincaid, IL his mother Florence and her husband Glen Fox of Texas, step mother Martha Pellinghelli of Tovey, IL 3 sisters Maryanna Pellinghelli and Tiffany Brooks both of Tovey, IL Pam Beitel of Pawnee, IL 2 brothers John and Jim Pellinghelli both of Texas along with several nieces and nephews. He was preceded in death by a brother Jeff Pellinghelli and his father Giuseppe “Joe” Pellinghelli Sr.
Funeral services will be held at 12 noon, Monday, February 4, 2019 at Masterson Funeral Home, Kincaid, IL. Burial will follow near Lake Shelbyville at Wright Cemetery, rural Findlay, IL. Visitation for Mr. Joseph “Joe” L. Pellinghelli, Jr. will be held from 11:00 a.m. to noon at Masterson Funeral Home, Kincaid on Monday. Memorials may be made to Lucia and will be designated at a later date.